At that time, investors were betting on Greece’s turnaround and that an improving macroeconomic outlook would turn all banks profitable as of 2015. However, the political developments that began last December and the uncertainty that prevailed over the last few months regarding the outcome of negotiations with lenders took a huge toll on the performance of bank stocks. At the same time, lenders’ fundamentals began deteriorating again. Banks’ market value at last year’s issue prices reached 31 billion euros, while their current market capitalization stands below the 10-billion mark, which is a nosedive of almost 70 percent. I examine below the impact of the last months on banks’ liquidity, asset quality and capital base, while also showing why capital controls must be avoided. The first negative impact that Greek banks felt since December concerned their liquidity, with deposit outflows and the gradual non-renewal of interbank lending. Private sector withdrawals started at 4.2 billion euros in December, peaked at 12.8 billion in January, remained at high levels in February (9.6 billion), eased to 2.2 billion in March and then increased again to 4.7 billion in April, according to the latest Bank of Greece (BoG) data. The breakdown of these outflows over this 5-month period shows that households withdrew 22.3 billion euros making up more than 70 percent with non-financial corporations following with 7.2 billion (23 percent of total). The bulk of outflows, 27.6 billion corresponding to 88 percent of total, stemmed from time deposits. Sight deposits, which mostly relate to corporates, posted withdrawals of 2.9 billion, while savings outflows did not exceed the 1-billion mark. BoG data on the evolution of money in circulation showed it rose by 13.3 billion euros in the December to April period. As I have previously explained, this suggests that more than 42 percent of outflows were and remain in cash and are stored, particularly by households, at homes, bank vaults or safety boxes. This clearly demonstrates depositors’ fears about a potential Grexit or the imposition of capital controls if the government does not clinch an agreement with lenders. In the Monetary Policy report the Bank of Greece published a few days ago, the central bank said that 4.4 billion euro of money withdrawn from December until March was sent abroad. Of this, 80 percent relates to corporates and just 20 percent to households. In addition, around 5 billion euros (20 percent of household and corporate outflows until March) were placed, mainly from households, with international money market funds. At the same time, general government (gg) deposit outflows accelerated as of March. Several gg entities, particularly pension funds, “voluntarily” transferred part of their cash reserves to a cash management account at the BoG for the government to cover its short-term external funding needs, largely payments to the International Monetary Fund and to replace foreign investor participation in T-Bill rollovers. In the December to April period, total deposit outflows reached 37.6 billion euros, of which 31.5 billion (84 percent) came from the private sector, 4.5 billion (12 percent) from the general government and around 1.7 billion from non-euro area residents. 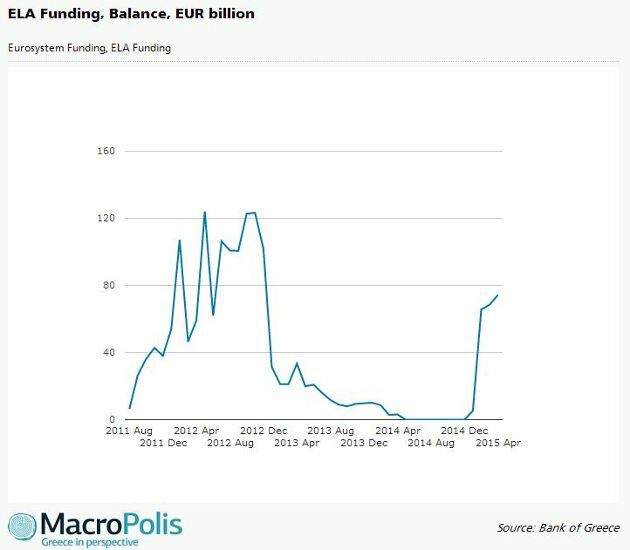 The extended deposit withdrawals coupled with the ECB decision (effective as of February 11) to lift the waiver for Greek government securities, previously used for ECB funding purposes, led to Emergency Liquidity Assistance (ELA) funding exceeding 74 billion at the end of April. Greek banks also used the EFSF bonds they received during their first recapitalisation process, which were mainly placed in the interbank market until December, for accessing liquidity from the ECB. Thus, their total Eurosystem funding reliance reached 112.8 billion at the end of April. Between the end of April and June 19, the ECB Governing Council has decided to increase the ELA cap for Greek banks by around 9 billion euros, closely matching deposit outflows during this period. Only last week, Greek banks reportedly suffered outflows of 4-5 billion euros, with around 2.5 billion leaving in the last two days of the week. At the time of the release of Q1 results in the second half of May, Greek banks indicated they had an ELA cash liquidity buffer of 38 billion euros, with NBG and Piraeus at 12 billion each, Eurobank at 8 billion and Alpha at 6.2 billion. Those estimates were based on current collateral valuation and haircut regime. Given that the ELA limit was raised by around 6 billion euros since then (implying a similar amount of deposit outflows), it would fair to say that this liquidity buffer still stands north of 30 billion meaning that banks do not have any shortage of collateral that could be used to access ELA liquidity at the moment. In the course of Q1, along with the deposit outflows, Greek banks also suffered from a deterioration of their domestic asset quality. Non-performing loan (NPL) formation went on an upward trend again after a short-lived slowdown in the second half of last year. This was mainly evident in the housing loan segment, where borrowers delayed their loan servicing payments also waiting for an NPL settlement scheme promised by the new government. At the end of March, Greek NPLs (loans past due >90 days) reached 74.5 billion euros - an increase of 1.5 billion within Q1. The NPL ratio rose by around 0.4 percentage points (pp) to 35.8 percent in Q1 from 35.4 percent in Q4. Both in relative and absolute terms, Piraeus, the largest bank by total loans, had the highest NPL ratio at 39.1 percent, which corresponds to 25.2 billion NPLs. On the flipside, National (NBG) remains the bank with the lowest NPL ratio in Greece, at 32 percent. NBG’s lower NPL also reflects the M&A activity of the other three core banks in 2012-13, which mainly absorbed banks that were endowed by high capital but worse loan quality. The deterioration of the domestic loan book, led to Greek banks’ group NPL edging up by 0.4 pp to 32.6 percent. NBG’s NPL ratio at 24.3 percent remains well below that of its domestic peers also due to Finansbank. The NPL coverage ratio (how many of NPLs are covered by cash provisions) remained stable within Q1 at 58.9 percent after improving by more than 6 pp in the course of 2014. Greek banks’ cumulative provisions (Loan loss reserves - LLRs) against credit risk rose by more than 1 billion euros in the course of Q1 and stood at 50.1 billion at the end of March corresponding to 19.2 percent of their gross loans. As expected, Piraeus which has the highest NPL ratio, has also the highest LLR ratio at 22 percent, whilst NBG has the lowest at 14.9 percent. The sharp rise of Greek banks’ provisions by more than 7.3 billion euros within 2014 had eroded a large part of the capital raised in the first half of that year. A negative impact was also evident by the revaluation losses of their available-for-sale portfolios. As a result, banks’ Basel III Common Equity Tier 1 (CET1) ratios, which ranged between 14.4 and 17.7 percent right after the capital increases, fell to an average of 13.6 percent at the end of last year. Following the 1 billion euros in additional provisions recorded in Q1, the CET1 ratio eased further to 12.7 percent at the end of Q1 2015. The fully loaded (FL) Basel III CET1 ratio displayed a similar trend and landed at 10.6 percent in Q1. Eurobank and NBG show the highest deviation between the two capital ratios as the fully loaded ratio strips out preference shares of 950 million and 1.35 billion held by the two banks respectively. Although Greek banks appear adequately capitalized at the moment, the acceleration of their NPL formation in Q1 and most likely in Q2 is eroding their capital and threatens their future capital base. Based on their current coverage ratio of around 59 percent, which is seen maintained at these levels by the end of the year, for every 100 million euros of new NPLs, banks would set aside as provisions 59 million. Management at the banks has indicated that the peak of the NPL ratio, which was previously estimated in Q2 2015, will be delayed by at least 2-3 quarters. This means that the raising of further capital may be needed, particularly if the NPL formation deteriorates for a prolonged period. Amid extended outflows, the imposition of capital controls appears as the highest risk in the short-term given the fragile depositor sentiment. Although in theory capital controls are imposed to safeguard the remaining bank liquidity, such a development would have several knock-on negative effects. A daily withdrawal limit of 300 euros, for instance, is more than enough for the average Greek household to cover its daily expenses. However, for a large part of Greek depositors this could be perceived as a serious threat on the future of their deposits and they could start persistently withdrawing their deposits, albeit in small amounts, although they have not shown such an attitude in the preceding months. At the same time, in a country where most individuals’ transactions are carried out in the form of cash, capital controls would restrain larger retail sales or transactions. This would have a negative impact on domestic economic activity. It is apparent that export companies would face the biggest hurdles, while for most companies and a and a relatively small amount of individuals that use electronic transfers for onshore payments the impact would be relatively limited. The biggest negative effect though would be on depositor sentiment, which is already fragile and would suffer an unprecedented negative impact that would further postpone any prospects for Greek banks to gather deposits. Out of curiosity, why do you a.) care and b.) keep talking about Greek banks? The Greek banking system was completely destroyed 4 years ago by the criminal PSI, the stupidity and amateurism of which could never again be replicated or superseded on a global basis. Following the moronic PSI all Greek banks were nationalized (albeit some false appearances of continued private ownership, in other words a continued fleecing of private investors). 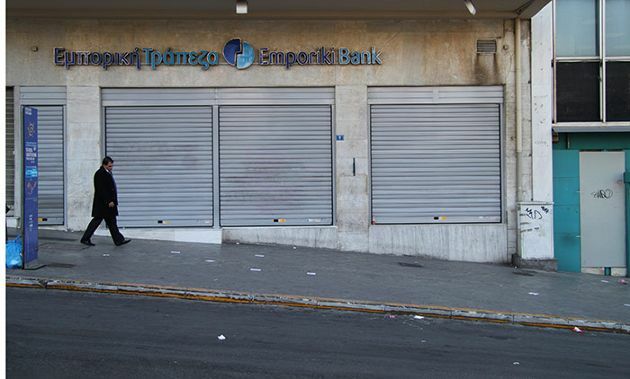 Even today the great majority of the Greek banks are owned by the state. Almost two years ago, the entire obligation to oversee the Greek banks was passed on to Draghi and the ECB. Since then the ECB has thrown at least 120 Billion euros of additional support to the Greek banking system over and above the 350 Billion of Greek sovereign debt owed. For all practical purposes the Greek banks are now the exclusive concern of the ECB which stands to lose all ELA proceeds in addition to a potentially total write down of all Greek debt. It's about time for all of us to realize that this government does not have any concern about the Greek banking system which is now practically owned and administered by the ECB since the original PSI completely blew it up to smithereens. Why would this or any other (subsequent) Greek government ever care for something that has already passed into foreign hands? At some point the Greek banks would be nursed back to health by the ECB and then the Greek state would be reimbursed for its substantial ownership of this European wreck called the remaining Greek banking system. It's so obvious that Greek banks(in their present zombie form) constitute no longer a leverage against the reigning Greek government according to Berlin's consistent blackmail strategy of the last 5 years. The PSI was designed to hold Greek banks as ransom to Berlin diktats but now such plan has failed completely.